Today the Federal Reserve published its much-hyped new Labor Market Conditions Index (LMCI). …A factor model is a statistical tool intended to extract a small number of unobserved factors that summarize the comovement among a larger set of correlated time series. In our model, these factors are assumed to summarize overall labor market conditions. What we call the LMCI is the primary source of common variation among 19 labor market indicators. One essential feature of our factor model is that its inference about labor market conditions places greater weight on indicators whose movements are highly correlated with each other. And, when indicators provide disparate signals, the model’s assessment of overall labor market conditions reflects primarily those indicators that are in broad agreement. The included indicators are a large but certainly not exhaustive set of the available data on the labor market, covering the broad categories of unemployment and underemployment, employment, workweeks, wages, vacancies, hiring, layoffs, quits, and surveys of consumers and businesses. So is there really anything new in all this? Well, not really. To me it is just another indicator for the US business cycle. The graph below illustrates this. 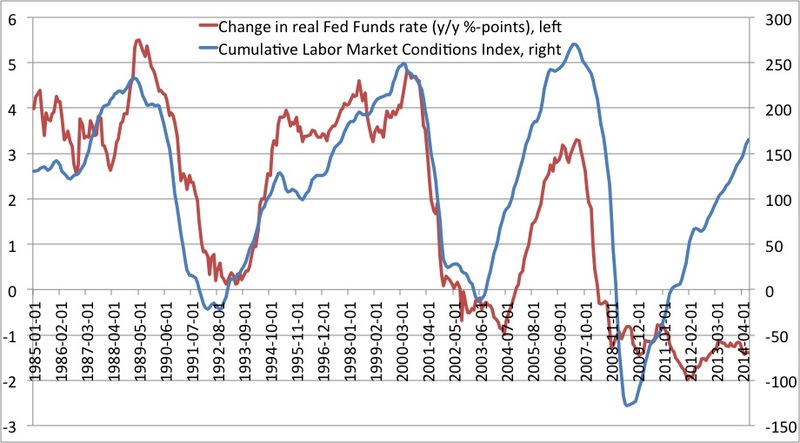 The graph shows the relationship between on the one hand the cumulative Labor Market Conditions Index and on the other hand the year-on-year change in the real Fed Funds rate. I have deflated the Fed Funds rate with the core PCE deflator. That said, there seems to have been a “structural” break in the relationship around 2001/2. Prior to that the relationship was quite close, but since then the relationship has become somewhat weaker. Anyway that is not really important. My point is just that the LMCI is not really telling us much new. That said, the LCMI might help the Fed to communicate better about it policy rule (I hope), but why bother when a NGDP level target would be so much better than trying to target real variables (fancy or not)? PS don’t be fooled by the graph into concluding the Fed Funds rate should be hiked. To conclude that you at the least need an estimate relationship between the LMCI and the Fed Funds rate.